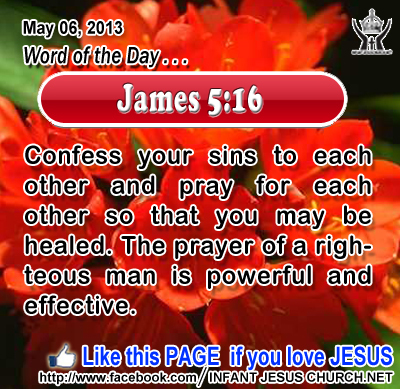 James 5:16: Confess your sins to each other and pray for each other so that you may be healed. The prayer of a righteous man is powerful and effective. Holy Father, we have sinned. We now confess our own personal sins. We ask for your forgiveness and for your Spirit to strengthen us in overcoming temptation. We want to live for you and not let our sin, any sin, entangle us and draw us away from you. Through the name of Infant Jesus we pray. Amen. 26But when the Counselor comes, whom I shall send to you from the Father, even the Spirit of truth, who proceeds from the Father, he will bear witness to me; 27 and you also are witnesses, because you have been with me from the beginning. (John 16)1 I have said all this to you to keep you from falling away. 2 They will put you out of the synagogues; indeed, the hour is coming when whoever kills you will think he is offering service to God. 3 And they will do this because they have not known the Father, nor me. 4 But I have said these things to you, that when their hour comes you may remember that I told you of them. I did not say these things to you from the beginning, because I was with you. Holy Spirit is inseparably one with both the Father and the Son. It is the Holy Spirit who gives life - the very life of God and who encourages faith in hearts receptive to God's word. The Spirit makes it possible for us to know God personally. He gives us experiential knowledge of God as our Father. The Spirit witnesses to our spirit that the Father has indeed sent his Son into the world to redeem it and has raised his Son Jesus from the dead and has seated him at his right hand in glory and power. The Holy Spirit tells us the knowledge, wisdom and plan of God for the ages and the Spirit enables us to see with the "eyes of faith" what the Father and the Son are doing. Through the gift and working of the Holy Spirit we become observers to the great work of God in Jesus. Jesus warned his disciples that they could expect harassment just as Jesus was opposed and treated with hostility. We have been given the Holy Spirit to help us live as disciples of Jesus. The Spirit gives us guts and perseverance when we meet adversities and challenges.